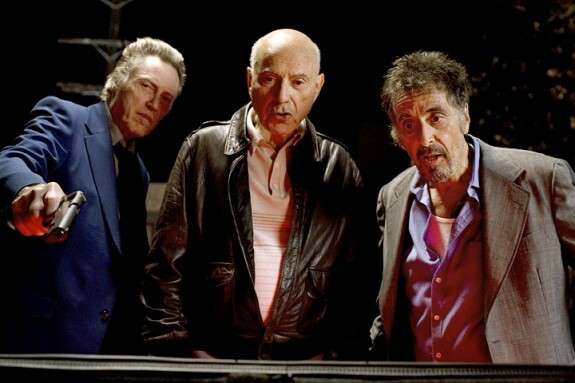 There was a time when any new film with Al Pacino, Christopher Walken, or Alan Arkin was reason to get excited. Those days are long gone. Sure, in the last twenty or so years they all have made the occasionally good movie: Pacino has The Insider (1999), Walken has Pulp Fiction (1994), and Arkin has Argo (2012). But for each of these, there are dozens of duds. How did these guys lose their mojo? For a little while, Stand Up Guys seems like it wants to right this wrong with its tale of three retired criminals who get together for one last night of reminiscing and troublemaking. They go clubbing. They steal cars. They take Viagra. They get into a high-speed chase with the police. Sound fun? It isn’t. By the time the end comes along and Pacino and Walken open fire on a gangster’s warehouse à la Butch and Sundance, I was feeling sorry for them. You can tell the old pros give it a go – Pacino nicely reigns in the theatrics for once – but they just can’t rise above the third-rate plot. Here’s to better days.